This is a rare name of probably north midlands habitational origins. It derives from the Old English pre 7th Century "Mype" meaning "The function of the waters" plus "Croft" - a piece of enclosed land used for tillage or pasture. It is presumed that such "a place" once existed but if so we have not been able to identify the spot, although there are many places with a similar or identical meaning such as Mitton, Myton and Mytton, all of whom mean "the farm by the function of the waters". 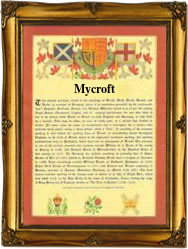 One of the most unusual "features" of this name is that it made a rare an unique appearance as a christian name, Sherlock Holmes brother being named "Mycroft". The surname is most popular in the Notts, Derbyshire and South Yorkshire areas, recordings include Mary Mycroft, daughter of Mathew Mycroft, christened at Southwell on March 5th 1713, whilst on April 15th 1769, Matthew Mycroft, the son of John, was christened at Throapham, Yorkshire. The first recorded spelling of the family name is shown to be that of Jane Mycroft, which was dated October 5th 1601, married Richard Harrison at Worksop, Nottinghamshire, during the reign of Queen Elizabeth 1, "Good Queen Bess", 1558 - 1603. Surnames became necessary when governments introduced personal taxation. In England this was known as Poll Tax. Throughout the centuries, surnames in every country have continued to "develop" often leading to astonishing variants of the original spelling.